I recently turned a bunch of random scraps into a protoquilt. The one above is a new bookshelf runner for my craft room. Protoquilting is a term I’ve been using to describe my random projects that serve to practice quilting techniques that may one day be used for a king-sized mammoth quilt for our bed. Protoquilting is my rationalized pasttime because, really, the thought of creating and quilting a king-sized quilt on my little machine is a little terrifying. So, protoquilts. Cute and easy. 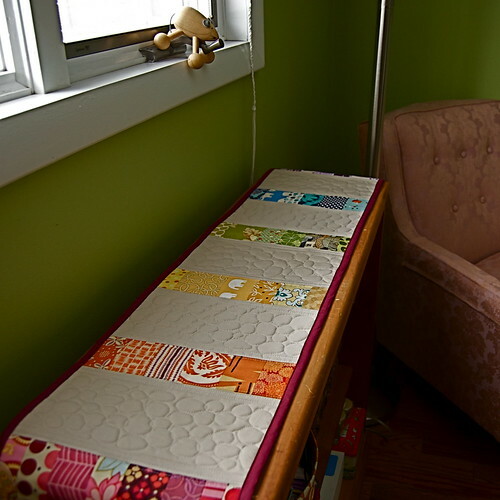 This particular protoquilt was quite inspired by this lovely baby quilt. I found myself enchanted by pebble quilting and thought I should give it a try. I love the way it turned out! And it feels really great in your hands. The beige comes from a skirt that I previously made and cut up. I like it much better now. And the finished product kind of matches my sewing machine cover. Instead of holding it on my lap, it’ll be serving to keep the grit and water off of my bookshelf from these here plants. It’s beautiful!!!! 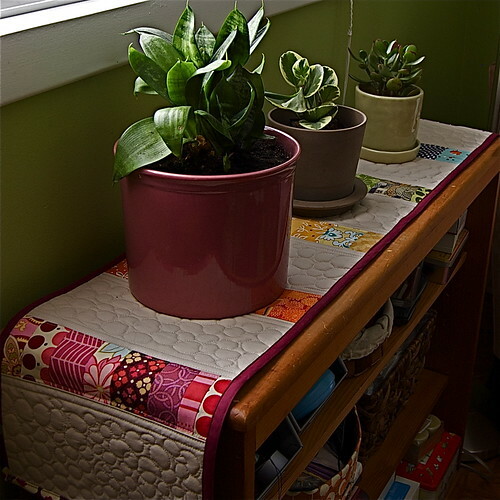 I love it – and I’d actually like to keep a jade plant alive, too. Or any succulent. They are so lovely… and I’m so bad at keeping them alive! Thanks, Beth! I think a previous jade plant mistake I’ve made is using normal soil instead of something really sandy and dry. I also heard somewhere that spritzing with a water bottle is a good way to water it and not overwater (guilty of that one, too). We’ll see! Its beautiful. I have been wanting to tackle that kind of quilting for a while now. Pretty! I like that it’s rainbow-themed without being too rainbow-ee. Thanks everyone! I loved making this one. Fast and easy, and I love the pebbles! I’d also like to present you with the Liebster Blog Award! It was presented to me earlier this week, and I’m sharing the love for your great blog! You can check out the details on my blog. Have an awesome day! Unsolicited advice: Forget the King sized quilt! Unless you’re going to do the “quilt as you go” method where you quilt smaller, more manageable sections and then whipstitch the batting and sashing together afterwards. I’m trying to do an oversized TWIN quilt on my domestic sewing machine right now and the bulk of all that fabric is killing me. No way would I try to do a King size! After this quilt, I’m not attempting anything larger than a lap quilt for cuddling in front of the TV. 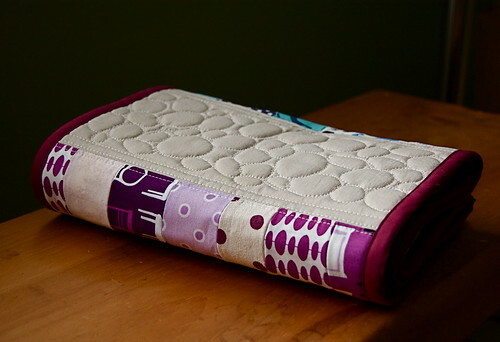 They make up faster, and are easier to gift as well because “surprise, I spent 2 years making a quilt for your bedroom in colors you can’t stand” doesn’t always go over well, but everyone can use a throw-sized quilt. I find that most of the really beautifully quilted King size quilts I see were done on longarm quilting machines, not domestic machines like ours, and there are a lot of talented professional longarm quilters that you could hire to quilt a giant King quilt. As for the jade plants? No advice there. My MIL gave me a huge jade plant when we got married that used to belong to my husband’s grandmother, and I killed it within two weeks from overwatering the poor thing! Protoquilting is definitely a great way in promoting productivity and industry. When did you first get this idea? I hope this will inspire other people. The jade plants at my house are alive and well and have been for years and years and years. Neglect is what they need! When the kids were little, I had the potted jade plants on the floor and the kids would run into them and knock the leaves off. Well, I didn’t get around to picking up the leaves and they sprouted right there in the carpet! So I picked the sprouted leaves up and put them in a small pot. I put the plants outside in the summer. This last winter I put them on a shelf by a window in an unheated attached garage. Guess what. . . they bloomed! I watered them maybe once a month in the winter, and about once every three weeks when they are inside the house. The best advice I can give is do not water very often at all–probably once every three weeks is plenty.